Baked Chicken Noodle Casserole is perfect dish for when you want a delicious comfort dinner that everyone will love. Best of all you can prepare this in under an hour, and have the whole family at your dinner table. This simply baked chicken noodle casserole is the perfect dish for the weeknight or even a potluck dinner. Easy to make, and you can put this dish together ahead of time if you like and reheat it when you are ready to serve. This is a great way to stretch your cooking budget too. Chicken, noodles, a couple of cans of soup, and some frozen vegetables can go a long way. 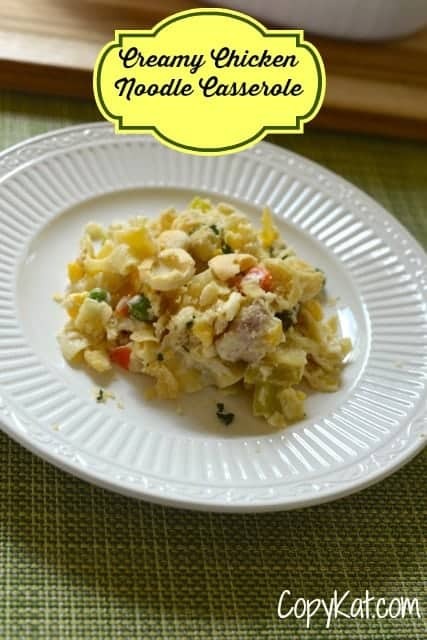 For a recipe like this baked chicken noodle casserole dish, I find you can use the store brands of soup. I often do not think there is a great difference when making casseroles. So I often buy what is cheaper depending on if I have a coupon or not. For this recipe, you could also use some leftover chicken if you have some on hand. I love getting those rotisserie chickens that many stores sell. I love using them as they are the first night, and the second night they can get turned into just about anything. If you like you could also bulk up this casserole with additional frozen vegetables, or you could even add some additional celery when we saute up all of the vegetables. You may be able to use what you have on hand as leftovers. If you like you could add some cheese to this recipe, I personally love this when served with a sprinkle of Monterey Jack or Sharp Cheddar cheese. A handful of Panko breadcrumbs tossed on top means you can have a crunchy top to this casserole. Anyway, you would like your casserole served up, I hope you enjoy this comfort inspired dish. Baked Chicken Noodle Casserole is a great way to stretch chicken breasts. If you need to cook the chicken place chicken into a large stock pot with enough water to fully cover the chicken breasts. Cook chicken on a medium-high heat until the chicken is cooked through. Depending upon the thickness of your chicken this can cake 20 to 30 minutes. When chicken is done remove from water and cut the chicken into bite-sized cubes. If desired you can cook the noodles in the water that the chicken came out of for additional flavor. While the chicken is cooking, saute onions and celery together in a tablespoon of butter. Sprinkle with about 1/2 teaspoon of salt. Cook onions and celery until both are tender and the onions become translucent. Cook noodles according to package directions. If you cooked the chicken you may want to cook the noodles in the water the chicken came out of for additional flavor. Drain noodles after they have cooked. Prepare the creamy sauce by combining the two cans of soup mix and the sour cream together. Blend until you have a uniform mixture. Add onions and celery to the sauce. Add frozen vegetables to the creamy mixture and stir them in well. Fill a 2-quart casserole dish with cooked noodles, and add creamy sauce and combine noodles and sauce in the casserole dish. In a small dish combine cracker crumbs and melted butter and blend until cracker crumbs are coated with butter. Spoon cracker crumbs on top of casserole. Bake casserole for about 20 minutes before serving. I’m not sure if Stephanie will see this, but this is the first recipe that I have ever tried on my own. Ever since I was young, I had a fascination with cooking and at 20 years old I finally made something on my own that was “grown up” besides baking desserts. I looked for something easy that didn’t require much stove top work as I didn’t have a clue about sautéing, how much oil to put, or even how to season anything! I also wanted to learn how make good home cooked, normal people meals. Food network is great but it involves weird creations that only people in the cooking world would actually enjoy. I call it identical to the fashion shows with weird clothes no normal person would wear. I have always wanted to learn how to cook so that one day when I have a family it could be a form of bringing us together and it makes me very prideful (in a good way) when I create dishes others enjoy. A few years later, I still enjoy looking at this video! I have gotten so much better and no matter what complicated dish I learned how to make, this is still my go to. It’s so comforting and delicious. This and the pumpkin bread are what first helped me start and learn new concepts. I appreciate all of your videos and recipes and I often share your collection. Please don’t ever stop! Thank you very much 😉 I do read my comments. It’s my goal to help you cook normal meals with food you can find in a regular grocery store! Um . . . What do I do with the chicken? (Sort of in jest, but really – near as I can tell the casserole is in the oven and the chicken is still on the stove. I will double check my recipe. thanks. 1. Instead of raw chicken can I substitute cooked pork, because that’s all I have in my fridge. 2. Can I use a white onion instead of a red one? Can you tell me what the difference is between them? 3. What is a good substitute for celery if you don’t have any? I was thinking maybe some parsley? 4. My family doesn’t like butter but loves “I can’t believe it’s not butter”. Are they the same thing? 5. I have high blood pressure so I was thinking of eliminating the salt. 6. I don’t have any condensed soups but would a chicken noodle soup and an 8 ounce package of mushrooms be OK? 7. The date on my sour cream container is 7/1/14 – Can I still use it for this recipe? 8. What kind of vegetables are in a frozen mix? My kids don’t like broccoli. 9. Can I use orzo instead of egg noodles? They taste the same, right? 10. I ran out of crackers, can I use salad croutons? I’d like to make this for dinner, the family will be home in an hour, I’d like to start in about 5 minutes. I’ll wait for a response. Oh, and my last question? How will this taste with all the changes! Ah 😉 Brilliant 😉 I loved that post. Oh this was said in jest. There was a post that went around that this went with. Do you have a favorite casserole you love? Hi Stephanie, I need your help, please. I love Stouffer’s Chicken & Broccoli Pasta Bake but don’t have a clue how to duplicate it. I would love their recipe, if you happen to have it or if you can point me in the right direction to find it. I’m new to your website but I’m loving it thus far. I’m not a great cook but can follow a simple recipe. Thanks for reading my reply – and appreciate any help you can give.. I am completely unfamiliar with this recipe. I am sorry I can’t be of more help.